WordPress websites by local developers and without the city price tag! At Get2it we take the worlds most popular website platform and craft a website specifically suited to your business needs and budget. We are a local digital marketing and web development company that’s worked with businesses in the West Lothian and Edinburgh area over the last 15 years. Our aim is to surpass your expectations. We want to keep you as a valued client so that we can work with you to help grow your business brand equity and online presence. All of the design and web development work the work is carried out in-house to ensure you get the best quality web product and service possible. Websites creafted to surpass your expectations! The Wordpress CMS interface is the most intuative on the market. Your website can be viewed on all mobile and tablet devices. Get the peace of mind that your website content will be protected. 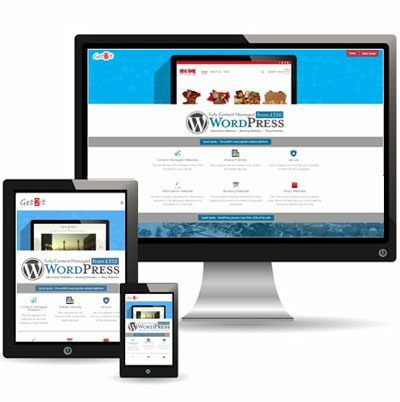 Depending on your business needs the function your new WordPress website can be a combination of any of the following. A fully loaded booking website for hotels, restaurants and small to medium business individuals. Over the past two decades we have developed a stress free and effective web development and deployment process for our new and existing clients. We invite you to try this out and let us know what you think. We will introduce ourselves and learn about your business, your brand and your vision for the future. We will help you choose the type of website that is best suited to your products and services. Choose either an information website, a booking website or a fully loaded online shop. We will setup hosting space and domain for your new website. If you are not happy with your existing hosting company, we can also help you switch. We will create a number of design drafts for you to consider and to discuss. Your feedback is important to ensure you are 100% happy so you can make UNLIMITED DESIGN CHANGES. You will work directly with John the web designer so that the process of crafting your website is effcient, creative and most importantly stress free. we’ll make any changes needed to get your website ready to go.